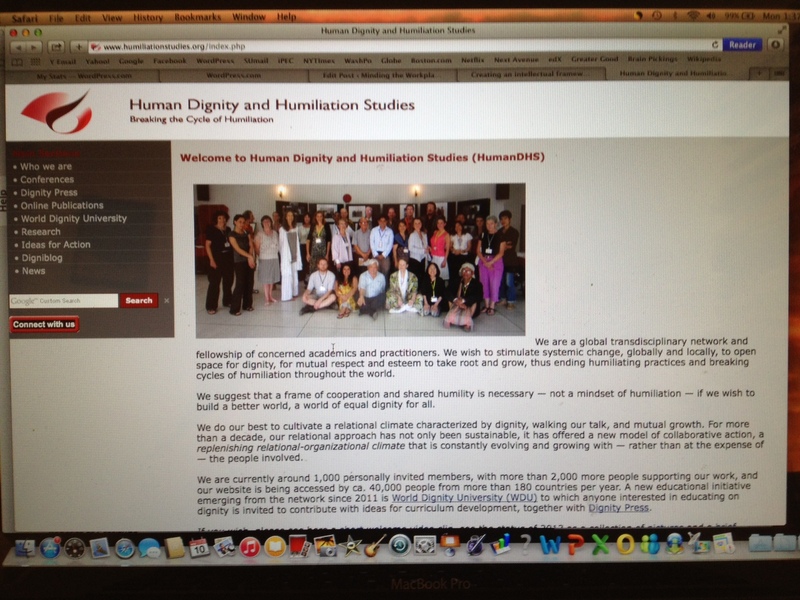 As I’ve written here on numerous occasions, Human Dignity and Humiliation Studies (HumanDHS) is a global network of scholars, activists, practitioners, and students who are committed to advancing human dignity in our society. In this blog post, I’d like to put a more complete frame around HumanDHS’s activities and highlight three of its emerging initiatives. The founding president of HumanDHS is Evelin Lindner, a physician, psychologist, prolific author, and self-styled global citizen. The director of HumanDHS is Linda Hartling, a psychologist and leading authority on relational-cultural theory whose spot-on assessment of workplace cultures is cited often in this blog. With a group of colleagues from around the world, they are stoking the flames for individual and social change. I am affiliated with HumanDHS as a member of its Global Advisory Board, and I have become a regular participant at the annual New York workshop (see below). This is one of my most treasured connections. In addition to sponsoring workshops, conferences, and other gatherings on a global scale, here are three HumanDHS initiatives that are getting off the ground and offering a lot of promise for the future. With your participation, the World Dignity University will become a global role model of excellence in scholarship. dignifying dialogue, and intellectual cooperation that ensures the survival of humankind and the planet. In 2012, HumanDHS launched the Dignity Press, which publishes professionally edited and designed books that examine human dignity and humiliation from a global perspective. Since its founding, the Dignity Press has published some 15 titles. More than academic-speak: Why a new university, book press, and academic journal? To achieve this, we need to create new institutions that show promise of filling some of that growing void. Between the World Dignity University, Dignity Press, and Journal of Human Dignity and Humiliation Studies, HumanDHS is creating an intellectual infrastructure around the concept of human dignity that transcends national boundaries and institutional lines. To be sure, HumanDHS must expand its breadth in order to have a wider degree of influence. It also must find ways to support sustainable intellectual work. These initiatives are a start. They have the potential to advance that core change, and it will be exciting to take part in their development. During December 4th and 5th, I’ll be participating in HumanDHS’s annual Workshop on Transforming Humiliation and Violent Conflict, hosted by Teachers College of Columbia University in New York City. The theme of this year’s workshop is “Work that Dignifies the Lives of All People.” I will be a featured speaker at the Workshop’s free public event on Thursday, December 4, from 5:00 to 7:00 p.m., discussing how we can advance dignity at work. If you’re in the NYC area and free that evening, please consider joining us! Dr. Yamada. You are my hero and a wonderful inspiration to myself and others who are trying to learn and disseminate information on various topics surrounding increasing dignity and worthwhile living. Lois, thank you for your kind words. Wishing you the best for a good and healthy 2018.